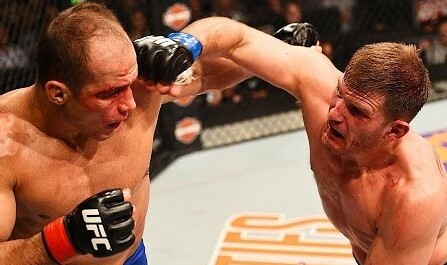 UFC heavyweight champion Stipe Miocic (16-2) will rematch former champ Junior dos Santos (18-4) when the two face-off on May 13 at UFC 211 at American Airlines Center in Dallas, Texas. Oddsmakers currently have Miocic a slight favorite over dos Santos on the live MMA betting lines, but let’s take a closer look at what’s behind the numbers. The two heavyweights first fought in December 2014 at UFC on FOX 13 when dos Santos defeated Miocic via unanimous decision. It was Miocic’s last defeat and he’s peeled off four knockout victories since then, even winning the heavyweight title from Fabricio Werdum in May of last year, and successfully defending the title against Alistair Overeem last September. Since their first meeting, dos Santos has only fought twice. He dropped a TKO to Overeem at UFC on FOX 17 in December 2015, and most recently, he won a unanimous decision over Ben Rothwell in April 2016. Dos Santos was supposed to fight Stefan Struve back in February but a shoulder injury forced Struve off the card and the promotion was unable to secure a replacement. Dos Santos originally won the UFC heavyweight championship by knocking out Cain Velasquez in November 2011. The 33-year-old Brazilian successfully defended the title against Frank Mir before losing the belt to Velasquez in a rematch in December 2012. Dos Santos fought Velasquez for the title once again a year later but was stopped in the third round. Dos Santos’s only losses in the UFC have been to Cain Velasquez, twice, and to Alistair Overeem, while Miocic’s only losses have been to dos Santos, and then Stefan Struve back in 2012. Twelve of dos Santos’s 18 wins have been by knockout and two by submission, whereas Miocic has finished 12 of his 16 wins via knockout and one by submission. It’s relevant to look at their last common opponent which is Overeem. Miocic knocked him out in the first round last September, while dos Santos was knocked out by Overeem in December 2015. It’s also relevant to note that Miocic fought three times last year, while dos Santos only fought once. Momentum is a real thing. Pick: We’re picking Miocic to remain champion due to the fact he’s been much more active and seems to have improved a lot since he and dos Santos first fought. Dos Santos had a pretty good showing against Rothwell, but the TKO loss to Overeem isn’t giving us any encouragement that “Cigano” is ready for the 2017 version of “Stiopic”.